What do you think when you hear the word ‘downsize’? Or ‘simplicity’? It might not be the most popular way to go green, but it’s often the easiest: Buy less crap. Especially crap you don’t need and crap that’s not going to add any beauty or positivity to your life. I got to thinking about this topic after reading one woman’s account of returning to the U.S. – specifically, New York – after residing in Mexico and what she felt upon visiting a common Target store. According to Sharon Beder, a professor of social sciences who researches the “power relationships” between corporations and consumers, “Advertisers spend 100s of billions of dollars a year worldwide encouraging, persuading and manipulating people into a consumer lifestyle that has devastating consequences for the environment through its extravagance and wastefulness.” Psychologists are paid big bucks to determine how to most cleverly convince the human brain to want what is being sold. I don’t even live in Mexico *sniff* and that’s how I feel pretty much every time I set foot in a Target. I’m even fairly good at getting in and out without needing that second cart because having a budget or practicing simplicity can make a person’s life greener by default. For example, I don’t buy a lot of goods that recently came off a less-than-stellar from a human rights and environmental standpoint factory production line in Chine that had to be shipped to the U.S. – but that’s because I don’t buy a lot of goods in general. Which isn’t to say I’m some holier-than-thou minimalist who never buys anything that wasn’t produced by a well-paid local artisan. There’s that budget, remember? I’m living squarely in the culture of stuff, just like everyone else. If you’re not living on a budget – lucky lucky you! – then you can still go green by default by faking it. Just make an effort to analyze your consumption habits and make a habit of asking yourself if what you’re buying is a want or a need before grabbing that second cart. Buying less crap won’t make you mega green, of course, but it’s definitely a step in the right direction! Organic, made in the US, and a hit with the preppy crowd? Well, huh. That’s Ball and Buck, a three-year-old clothing and accessory company specializing in, what else? T-shirts. That would be small-run organic cotton t-shirts manufactured in the U.S by people making a living wage and adorned with hand stitched pockets made out of recycled and vintage fabrics. Unlike a lot of companies that target a young crowd, Ball and Buck isn’t shy about pushing its ethical and environmental agendas. Its whole shtick is that you can wear the kind of clothes you want to wear without hurting the earth or the people who call it home. Checked pockets might not be my thing, but I can definitely get behind their message! Have you gotten into clothing recycling? Maybe a little thrifting, a little DIY? Dead Bodies Warming Hard Bodies? What good are the dead? Some might say none at all. But one English town, a burg of 80,000 known as Redditch, thinks they can be put to use as a nearly-free source of energy. It’s less gruesome than it sounds, really. No one is proposing that vagrants be rounded up as a free source of power or anything like that. The Redditch Council simply wants to warm the local Abbey Stadium Sports Centre, including the heated swimming pool, with reclaimed energy from its neighboring crematorium. I don’t know how comfortable people would feel about the swimming pool being heated due to the death of a loved one, I think it’s a bit strange and eerie. Huh. Considering that the measure could save the town about $30,000 per year aaaand the fact that the dead who are cremated at the Redditch crematorium will be returning to ashes whether or not the municipal pool benefits, what’s the big deal? It seems like a case of people being squeamish just because the dead are involved. No one is burning the dead *specifically* to supply heat to the sports center. The will be no contact between the dead bodies and the crematorium and the hard bodies at the gym. And reclaimed heat is apparently a good source of heat, too – here in MA, for example, waste heat from a Cambridge power plant will be used to heat buildings in Boston instead of being discharged into the Charles River. Am I being too blasé about this? Because in my mind, a scheme like this makes perfect sense and seems like a great way to make use of energy that would otherwise just get blown away by the wind. Could You Choose 10 Essentials? It’s pretty widely agreed that there’s a lot of overlap between the green movement and the minimalist movement. If you don’t have a ton of stuff, you don’t need a ton of space, which means you don’t need to waste a lot of time, money, or or energy heating/cleaning/maintaining/powering/etc. a ton of stuff or space. Minimalism isn’t necessarily green, just as eco-friendly living doesn’t mean having to live like a monk, but taking a few minutes to consider what you own and why you own it can be plenty green. Leo Babauta of Zen Habits posted about choosing your 10 essentials a la the GQ series – not 10 essential possessions, but rather your 10 essentials for living. What you wear, what inspires you, where you love to be, that favorite food you can’t live without… that sort of thing. And I found the idea to be extremely inspiring. When you create a list of your 10 essentials, you gain a whole new perspective on all those things that aren’t strictly necessary at all. Turns out there’s a good chance there’s plenty of stuff in your home and in your life that you could get rid of without ever feeling deprived. What’s on your list of 10 essentials? What have you realized you can live without? Too Many Sweaters… Not Enough Scarves? The other day, I took an old sweater of mine and turned it into a dress for La Paloma. I’m really proud of the end result but… I winged it, so there are little things wrong with it. Seams that don’t line up particularly well and so on. If I hadn’t been impatient and had followed directions created by those with more repurposing experience than me, maybe it would have been even better. Turns out, I still have a ton of old and new sweaters that I’m probably never ever going to wear – sorry, bad gift givers! When I went looking for more repurposing ideas, I found a great tutorial for turning a sweater into a hat and scarf. Okay, it’s technically a hat and scarf set for a kid, but with a big enough sweater, the sky is the limit! No need to make an owl – or even an animal at all. But if you like the animal idea, the sky is still the limit. 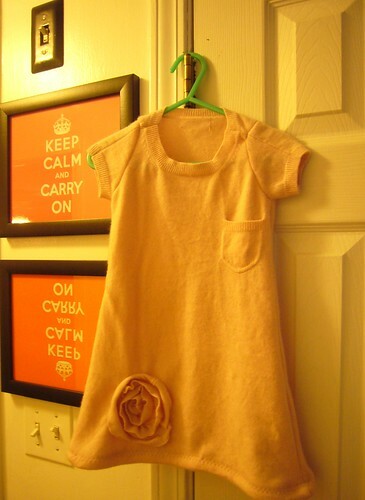 This is the kind of clothing repurposing I love – that and t-shirt mods. Tim Wigmore’s Giddyup is meant to keep you moving while you work or watch TV – and it’s supposed to be more fun than sitting on one of those exercise ball chairs. If you opt for this over that, though, I recommend investing in some all-natural leather conditioner to keep your seat supple. Boy, the last couple of posts have been downers. Greenwashing? The problem with carbon negativity? Huge islands of garbage? Bleah. It’s that kind of stuff that keeps some people from embracing a greener lifestyle. Not that it’s right – more knowledge is almost always a good thing – but there are plenty of people who, when confronted with a huge problem, would rather close their eyes to it than figure out how to become part of a solution. That’s when those green baby steps I mentioned on Monday come in handy… and one of my favorite green baby steps is re-use! Re-use doesn’t always have to mean stuff like washing out plastic zipper bags or using a sewing machine to turn old clothes into smaller, less holey clothes or finding uses for every single coffee tin you’ve ever accumulated. Though, frankly, they’re all good things to do. Sometimes re-use means taking something that’s basically unwanted and turning it into something artful and beautiful that makes your personal environment that much nicer. Individuals can do this all on their own, of course, but not everyone is crafty by nature, which is why companies like Ghost Furniture exist. They specialize in making the unwanted into the coveted, and they do a pretty good job of it. Right now, I’m lusting after this piece, which began its life as a dressing table mirror found in an abandoned house. Ghost Furniture added five delicate little vintage patisserie tins, a fabulously ornate vintage cake server, and two delicately decorated spoons, and painted the whole thing in a matte grayish taupe color that highlights the unique silhouettes of each object. If that isn’t a sweet way to re-use old kitchen accessories that aren’t pulling their weight at mealtimes, I don’t know what is. And even though this particular piece costs £175, I can easily see even a non-crafty person DIYing it with either things he or she had around already or little things found at garage sales and swaps for cheap. Unless you’re one of those people who religiously takes down your Christmas tree on the first of January, there’s a good chance it’s still sitting in your living room, possibly looking a little worse for wear at this point. I can understand why it’s still up. In addition to the whole tedious business of taking off all the decorations, there’s also the question of what to do with the thing. Unless you have a fake Christmas tree, in which case it will go back to living in the basement for the next 11 months, it’s time to start thinking about how to dispose of the Christmas tree. Put it in the trash? No way, that’s for amateurs. Recycling the Christmas tree? Now that’s what I’m talking about. Old Christmas trees make awesome hiding places and roosting spots for passing birds – especially if you lure them to it by “decorating” your tree with peanuts, orange slices, cranberries, strings of popcorn, suet, and seeds. Just stay away from starchy decorations, as these will attract raccoons and chipmunks instead of birds. If you don’t have a lot of places for wild fliers to hang in your yard, this is a great way to recycle your Christmas tree and invite some native birds to spend part of the winter with you and your family. For those without fireplaces or access to community tree recycling programs, branches can be used in compost or on top of flower beds for the rest of the winter… but what to do with that pesky trunk? Turns out the trunk of your old Christmas tree might be just the right diameter for coasters. All you have to do is saw off as many rounds as you like (from the dry part of the trunk, not the part that was in the water), sand the rounds smooth, varnish or seal them (do one side and let dry before flipping), and then attach felt dots to the bottom. It’s amazing how long those needles with stay green and fragrant if you’ve been taking good care of your Christmas tree. And it’s not that difficult to weave a garland or turn green pine needles into a sweet smelling potpourri with the addition of cloves, cinnamon, dried orange peels, and other nice stuff. Make one or both, and you can extend the holiday season without being one of those people who keep their tree up until April. Do you have a neighbor with a chipper? Or maybe you just have a lot of post-holiday aggression to get out and you’re handy with a saw. Either way, it’s possible to mulch your own Christmas tree given the time and the right equipment. For those without access to a chipper, some towns have mulching events where anyone can walk in with a Christmas tree and walk out with a free bag of mulch. …and let them handle it. Many locales provide pick-up service between certain dates because old Christmas trees become free mulch for city property, but if yours doesn’t, you may be able to drop off your tree at a Christmas tree recycling center somewhere nearby. Try ringing up your town hall to find out how and where you can make your tree someone else’s responsibility. Browsing Eco-Chick recently, I was delighted to stumble onto WASTE since I am a bag fiend. Waste handbags are not only absolutely fantastic, they’re also made exclusively out of discarded materials from the auto industry. I’m talking discarded leather arm rests and head rests, seatbelts, rubber straps, and more. What you end up with is a bag made from high quality materials that are designed to be durable, which is just the thing when you’re looking for an everyday bag. Every WASTE bag is completely unique because they’re crafted out of what’s available so nothing new is needed to produce them. WASTE’s artisans un-stitch all those discarded parts and then craft something durable and beautiful by hand to achieve a color-coordinated, polished look. Why’s this important? Car upholstery uses a lot of leather (and other stuff), and about 45% of what is used is tossed out. Using the leftovers means less garbage in landfills and less energy spent on making new materials for other industries – in this case, the handbag industry. As you can probably guess, these green handbags don’t come cheap – my favorite prices in at €193 for the option currently available – but if you have the money and need a bag, why not WASTE? Still have leaves on your lawn? Me, too, though that’s because we have an excess of trees, not because I’ve been lazy about raking. I rake not because I care about how those pretty autumn leaves look – I actually think they look really pretty – but because most of the lawns where I live are made of grass that has a growing period in the fall, pretty fall leaves can eventually get mildewy and gross, and I’d just end up doing it in the springtime. But what to do with all those leaves, especially if you’re like me and have a ton of trees? I have two easy, green options for you: composting and/or mulching. Composting leaves is awesome and easier than bagging them up for the city to take away, especially when you consider that the city uses those leaves to make free compost and mulch. No compost bin (or no space for one)? No problem! Now you can get reusable compost bags that can sit anywhere in your yard. For best results, shred your leaves first – some mowers do this – but don’t worry too much if you can’t. Mulching leaves is also awesome. In natural settings, leaves form a natural carpet over the soil surface which conserves moisture, modifies temperatures and prevents soil erosion and crusting. Shredded leaves can be used as mulch in garden beds, veggie patches, and anywhere else you’d use mulch purchases at the garden center. Whole leaves can be used at the base of trees and shrubs where you’d rather not see anything at all growing. If you still see weeds coming up, a thick layer of newspaper right on the soil under a foot of leaves (that will mat down soon enough) will knock out pretty much everything. How do you deal with your yard waste?